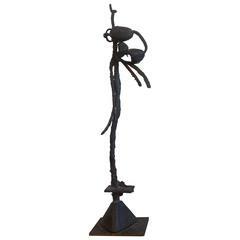 Modern Bronze Sculpture "Concert Pianist"
An interesting yet handsome piece of modern art, with an organic insect like form. 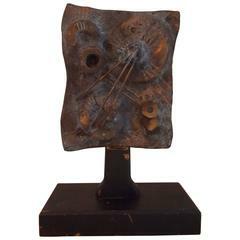 Made of cast bronze No signature. It's probably a one-off. A nice decorative form in space. 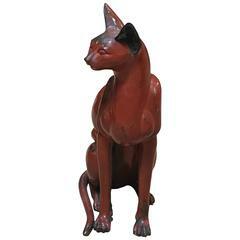 French Art Deco bronze cat sculpture. Lacquer red finish. 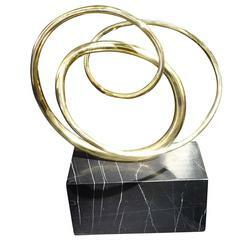 A modern bronze sculpture of a flowing concert pianist. He wears a gilt bow tie and plays the grand piano. Signed "Ruth B., 1992" Edition 2/3. 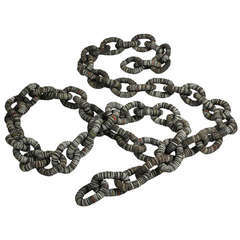 Giant 1960s brass chain link paperweight. Beautiful and solid piece, good weight, 2lbs. 5.3oz. No makers marks. Presented in unpolished, original finish.